Designed by Edward Thompson, Chief Mechanical Engineer of the London North Eastern Railway (LNER), the B1 class was a wartime utility mixed-traffic locomotive for general passenger and freight duties. A total of 410 were built between 1942 and 1952 and were to be found throughout the former LNER system in England, Scotland and, for a short period, on the Southern Region. 1264 was built at the Glasgow works of the North British Locomotive Company (works number 26165), at a contract price of £16,190. 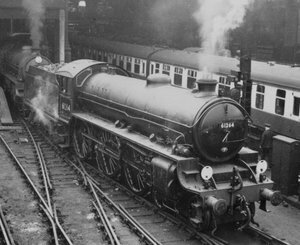 61264 at Liverpool Street, c. 1950, awaiting next turn of duty. Another (unidentified) B1 is in the background. The locomotive was despatched to Stratford for acceptance trials, thence to the London and North Eastern Railway depot at Parkeston Quay, Harwich, where it entered traffic on 5th December 1947. It was to stay at Parkeston Quay for nearly thirteen years, being put into service hauling express passenger trains to and from London Liverpool Street station, frequently working the famous ‘Scandinavian’ boat trains. 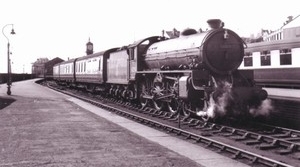 In November 1949, the locomotive exchanged its green LNER livery for BR Black and was re-numbered 61264. 61264 at Colwick MPD, 22nd August 1964, three months before withdrawal from main line service. Photo (c) A.G. Bell. The introduction of electric trains and main line diesel locomotives to the Great Eastern section in the late 1950s meant that, in November 1960, 61264 left the East of England for Colwick depot in Nottinghamshire, following a General Overhaul at Stratford works. It was to remain at Colwick for the rest of its working life. 61264 was used on the many express passenger services between Nottingham, Leicester and London (Marylebone) along the old Great Central route. Once again the introduction of new diesel services meant that steam was relegated to the mundane parcels and excursion duties. 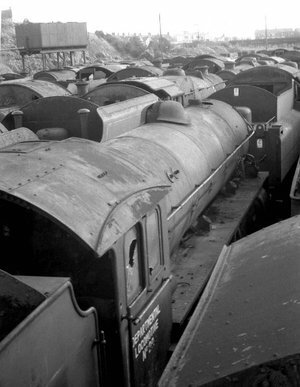 61264 amongst the vast throng of steam locos awaiting the cutter’s torch, Woodham Brothers scrapyard, Barry, South Wales, 13th August 1968. By 1965, the complete end of steam was in sight and 61264 was condemned in November of that year. Rather than being scrapped immediately, the loco became Departmental no. 29 and was allocated to stationary boiler duties, still at Colwick. There she became very run down, to the point of losing her centre driving wheels. Final withdrawal came in July 1967, whereupon the centre driving wheels were replaced and the engine was sold for scrap to Woodham Brothers of Barry, South Wales, where she had arrived by April 1968. 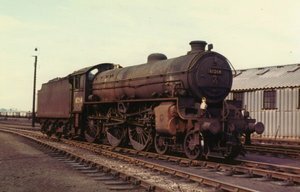 61264 was notable for being the only ex-LNER locomotive to be sent to Barry, long after all but one other of the B1 class (61306, now called ‘Mayflower’) had been cut up for scrap.